Eldersblood Peak is a dragon lair located in the mountains south of Morthal. Its word wall teaches part of the Disarm shout. To reach Eldersblood Peak, go a short distance west on the main road south of Morthal and look for a dirt path to the left. The long dirt path winds past an unmarked hunter's camp and North Cold Rock Pass. There is a dead troll on the lowest level and on the second level there is a sacrificial table with two leveled potions. To the left of the third level is a snowberry plant. In front of the wall is a dead cow and another dead frost troll. 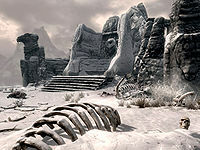 The leveled dragon is usually resting on the wall, but the skeletons near Rannveig's Fast can enter the dragon's detection area, and it will fly off to investigate. The dragon's chest is to the right of the wall, between the word wall and the brick wall. Before the dragons' return, the word wall is guarded by three frost trolls, and occasionally some frostbite spiders as well. There is one troll on the lowest level and the other two are near the word wall. After the dragons' return, there will be a burned corpse surrounded by scorch marks, next to the table, below the peak. The dead cow in front of the word wall also does not appear until after. But there are no other differences to the location. Sometimes the word wall will glow or play the sound effects but no word will be given. Reloading the previous save should fix this. In the case this proves to be ineffective as well, quitting and re-launching the game will solve the problem. Striking the wall with a spell and pressing against the wall may also be effective. This page was last modified on 6 August 2016, at 04:51.